Ericka is the embodiment of hip hop. She is a Bgirl that is full of bursting energy, optimism, love, and expressive art. Her emersion into the hip hop culture has not been a passing hobby. Ericka began break dancing her teenage years at Youth Advocates centers and continues to be a part of the culture 22 years later. 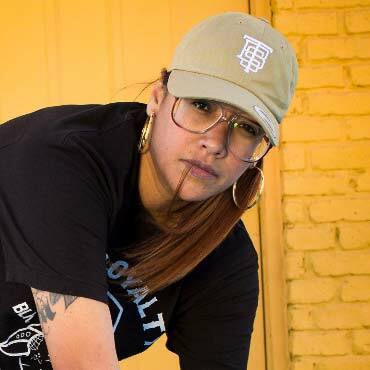 The hip hop culture has provided Ericka place of joy, acceptance, a source of love and encouragement, and a foundation for career opportunities. Through dancing she has met and bonded with her husband of 19 years. The positivity that surrounded her has served as encouragement to put herself through nursing school at a young age raising two boys. She states that she is indebted to hip hop, so she invest her energy in giving back to the culture. Along with her husband they have started and grown an affordable, yet cool, break dance apparel line for less fortunate dancers to fit in. They are engaged in break dancing events nationally to provide support to the culture. Ericka is also the founder of Bgirl City, an annual women’s break dancing competition. She wanted to give life to what the few passionate females in the industry desired, “a league of their own,” and it been a compounding success year after year. Her body doesn’t have the same energy it once did, but she will never stop doing what she loves, dancing.